General Santos City – In celebration of Blackbeard’s Seafood Island 10th year of Extreme Seafood Bonding, it offers the best seafood dining experience to everyone and tries to stay true to its core values of Seafood, Sarap, Saya! It also offers live Seafood choices through “Paluto”. With great idea of innovating the Filipino casual grill dining experience by bringing to the market the first and the original ‘Boodle Feasts’; it creatively re-inventing the way ‘Filipino food bundles for groups’ are created and presented – a trend adapted by most of the other Filipino grill concepts soon thereafter. Seafood Island’s Boodle Feasts provide customers with a wide array of Island-Inspired Filipino dishes in a food setting that is perfect for sharing and bonding experience. 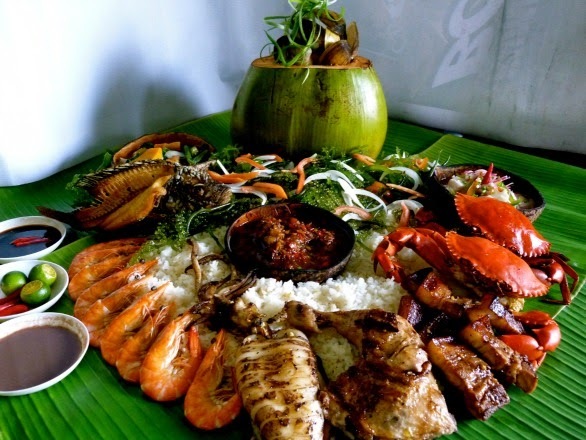 Eating with one hand directly from the big banana leaf with grilled meat and rice on it is what Boodle Feast is. Yesterday, September 16, 2014, the famous Mt. Apo Boodle falls down to 1,010php only from its original price of 1,650php. Thus, gives another reason to everybody to chow and share an extreme bonding experience. In line with Seafood Island’s rapid expansion across the Philippines with 28 branches and counting which makes it a Seafood Island nation, it also opened doors to new restaurant concepts under the group that includes Bikers’ Café, Bone and Barrel Bistro and soon to be opened Chopsuey. Bikers’ Café is catered to a market that prefers a balanced, healthy lifestyle that offers bike parking and shower. Bone and Barrel Bistro is a cowboy inspired concept that banks on steak and shank redemption, which offer a variety of tapa, steaks, bulalo and flavored beers. Finally, Chopsuey will offer Filipino-Chinese style comfort food. To be significant to the community, the 10th year of Seafood Island marks its effort to give back to the community. Seafood Island will be launching Batang Tri Grassroots Program as a tie up with Coach Jojo Macalintal. The Batang Tri Grassroots program and Jojo Macalintal or more known as Coach Jomac has a vision to make triathlon not only known to the elite but to instill the sport to everyone. With his humble beginnings, Coach Jomac's accomplishments and experiences can help these children through his training program as a way of giving back to the community. Anyone can help the program by purchasing a Jomac Boodle for P1,450 where P300 will be given to young aspiring triathletes to achieve their dream. Proceeds that will be collected from Jomac Boodle will be used to raise funds to purchase 100 road bikes and provide grants in terms of equipment, clothing, race fees, accommodation, food, training, and travel needs of these children.